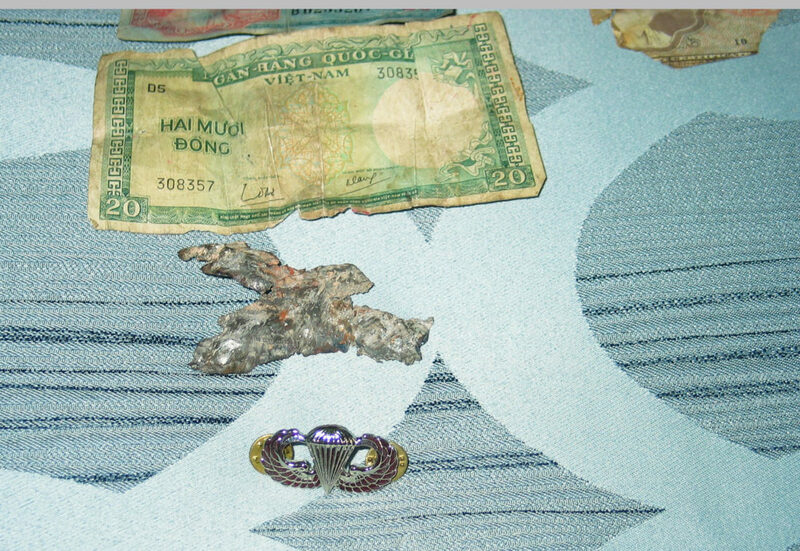 PHOTO SUBMITTED Some of the items returned to Carol Poirier included Vietnamese money (top), the airborne wings earned by her husband, Paul, when he completed jump school (bottom) and a piece of shrapnel that had killed some of his friends. A Massachusetts woman has been reunited with her husband’s stolen belongings with help from Tiffin Police Department and Tiffin Fire Rescue Division. Carol Poirier, a 68-year-old Massachusetts resident, said her husband, Paul, was a Vietnam combat veteran who served three years in the Army’s 101st Airborne Division and served in Vietnam from December 1967-December 1968. He earned several medals, including a National Defense Service Medal, Vietnam Service Medal with two Bronze Stars, Vietnam Campaign Medal, Army Commendation Medal, Bronze Star Medal, as well as a Combat Infantryman Badge and Parachutists Badge. Poirier said her husband was a Canadian citizen and a registered alien in the United States who moved here when he was 16. He was drafted, but had his paperwork changed so he could enlist because he wanted to be a paratrooper, she said. “He wasn’t even American, but he was so proud of his service,” she said. Paul Poirier died in April 2009 from cancer as a result of being exposed to Agent Orange in Vietnam. She said she mailed all of Paul’s memorabilia to her son in Texas because her grandchildren were close with Paul and wanted something to remember him by. In September 2016, her son and his family moved to another part of Texas and most of their belongings were stolen from a moving truck. However, she said nobody knew that included all the items she had sent to them. Poirier said that in the last week of January, Stephanie Cerami, a woman from North Carolina, called wanting to talk to her about her husband’s belongings. Poirier said she was afraid Cerami was a scammer, but finally talked to her the third time she called. Cerami is a 20-year Army veteran who is retired and “was livid” that Poirier would sell her husband’s service items. After telling Cerami she wasn’t selling his items and discovering that they were being sold by someone else, she contacted eBay, but the company wouldn’t help her. Poirier said she was “completely devastated” because she hadn’t known his items were stolen. Poirier said she and Cerami wrote to eBay and discovered the man selling the items was from Tiffin, but he wanted $250 for them, so Cerami and Poirier contacted Tiffin Police Department. “I didn’t know what to do and I wanted to know if there was anything they could do to help me,” she said. She said Cerami spoke with Officer Eric Aller and when Poirier called, she spoke with Lt. Jason Windsor. Chief Fred Stevens of Tiffin Police Department said after being notified of the medals being sold, it was determined the man had purchased the items legally on eBay, not knowing they were stolen. The man, who Stevens said was from Tiffin, wanted to recoup what he paid for the items and said he gladly would return them to the veteran’s widow, Stevens said. However, Poirier said she is on Social Security and could not afford to buy them back. Stevens said Windsor took up a collection at the police department and Tiffin Fire Rescue Division to come up with the $250 to purchase the medals. Windsor offered to personally pay for the medals if the goal wasn’t met, Stevens said. “It was pretty nice he got it together and did that for her,” he said. The initial buyer, Chad Hartzell, who said he now lives north of Republic, said he bought the memorabilia because his grandfather served in the 502nd Parachute Infantry Division, 101st Airborne Division during World War II. “I collect and deal, and buy and sell a lot of military coins and antiques,” he said. Hartzell said he was worried at first that Poirier was a scammer trying to get the medals, and was grateful the police department verified her story. He said many families have had memorabilia lost and he has been able to return items to their owners in the past. “Her husband served our country and it means a lot we were able to help her,” he said. Windsor said it was generous of everyone who contributed. “Tiffin Police Department and Tiffin Fire Rescue Division officers and firefighters all donated money to be able to buy the stuff back and (Hartzell) took $50 off the price to help as well,” he said. Poirier said the department paid to ship her husband’s belongings to her. She received her husband’s medals, dog tags, 101st Airborne uniform, commendation certificates and paratrooper pin and the department included a coin, a pamphlet about the department with a patch, and a letter. She said nobody could believe the Tiffin Police Department did this for her.